The history of fire fighting in the US is an interesting one. One of the first recorded instances of a law being introduced to reduce fire hazards can be traced back to Boston in 1631 when the Massachusetts Bay Colony reportedly banned smoking in public places after a major fire broke out in Boston. The first fire fighting system was subsequently set up in New Amsterdam in 1647. Fire wardens were appointed to inspect houses and chimneys for fire hazards and issued fines if potential hazards were identified. A ‘rattle watch’ was also established – this was a small team of men who made the rounds of local streets at night keeping an eye out for fires. If they came across one they would use wooden rattles to alert people nearby. Mutual ‘fire societies’ also started to appear in the colonies from around 1711. These small groups of fledgling fire fighters provided mutual fire fighting assistance to society members. New York subsequently imported the first water pumping engines in the 1730’s and the first volunteer fire company was established in Philadelphia in 1736 by Benjamin Franklin. More of these companies sprang up in other colonies across the country and it wasn’t long before the ‘heroic’ volunteer fire fighters who belonged to them were lauded in newspapers and made the subject of popular prints. The early fire companies were also thought of more as social groups rather than official organizations and belonging to one gave a person social status. Sadly, this iconic status wasn’t to last. By the mid 1800s the volunteer ‘profession’ was dogged by a reputation for inefficiency, disorder and riotous behaviour and many of the volunteer organizations were beginning to be replaced by official fire departments with paid personnel. Ohio introduced the first totally paid fire department in Cincinnati in 1855 and more soon followed around the country. Some of the funding for the early volunteer fire companies came from payouts from insurance companies for fighting fires in fire insured buildings. These buildings could be easily identified by fire insurance marks on the fronts of the buildings and, as is often the way when money is involved, getting fire fighters to attend to fires in clearly uninsured buildings soon became somewhat problematic for many owners of those buildings. Up until the 20th century a fire fighter’s job was pretty standard – it mostly involved fighting fires in fairly simple predominantly wooden structures. However, with the advent of technology and the increasing use of steel and other types of building materials, building structures were changing and fire fighting techniques and methodologies needed to develop alongside them in order to remain effective. 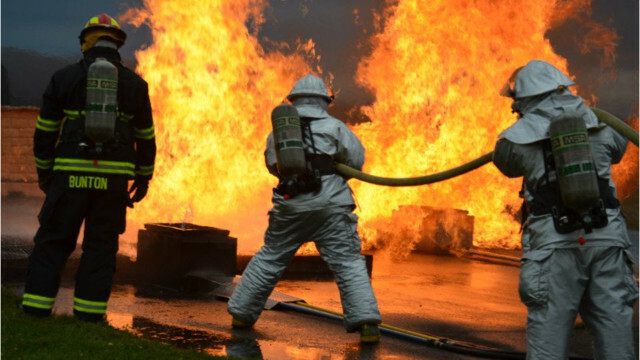 Therefore we began to see the introduction of more specialised training such as fighting fires in high-rise structures and confined space environments as well as emphasis being placed on educating fire fighters about building construction as it relates to fire fighting. The expanding American population was also increasingly spilling out into previously uninhabited wild land and bushland areas with the added risk of wild land fires, leading to specific training in wild land fire fighting. Then there is our well-known love affair with the motorcar and its associated risks so fire fighters today are trained in vehicle rescue techniques as part of their First Emergency Response training. Fire fighters have also become more involved in other areas somewhat originally related to fighting fires, such as care giving and life saving and today almost all career fire fighters and most volunteers in the US are now also trained Emergency Medical Technicians and have emergency medical assets available for immediate deployment. They are also taught how to deal with hazardous materials incidents. Indeed, many firehouses now respond to more medical emergency related calls than they do fire emergencies. By 2011, official statistics had put the total number of fire fighters in the US at around 1.1 million with around one third of those being paid professionals. One of the early duties of a fire fighter was helping to pull the water pumping engines to fires and in 1818 a lady named Molly Williams made headlines when she joined the menfolk on the dragropes and in so doing became the first known female member of a fire fighting crew in the US. This article is provided by rickyrescue.com. Contact Ricky Rescue Fire Academy for more advice and help to take your fire career up a notch by becoming a Fire Officer in Florida and Tennessee.